Tracking the cycles of the moon within my own body has been a beautiful experience for me. Over the past few years, I’ve been on a journey of getting more closely aligned with nature, la luna in the sky, and the wisdom of my own body. The results of which have brought me so much closer to the core of who I am and have helped me see and feel my connection to all living things - unleashing a depth of creative expression I’ve been yearning for for many years. Last summer, I did a 6-part blog series delving into the often taboo topic of moon cycles (i.e. periods). The response to the series was really awesome. It turns out, a lot of you want to explore this topic alongside me. Because I’m a dabblist, I wanted to take all the wisdom I had gained around this topic and channel it into a creative project. And then I found out about feminine moon cycle tracking bracelets. The concept is to wear a bracelet where each bead represents a day of your monthly moon cycle. 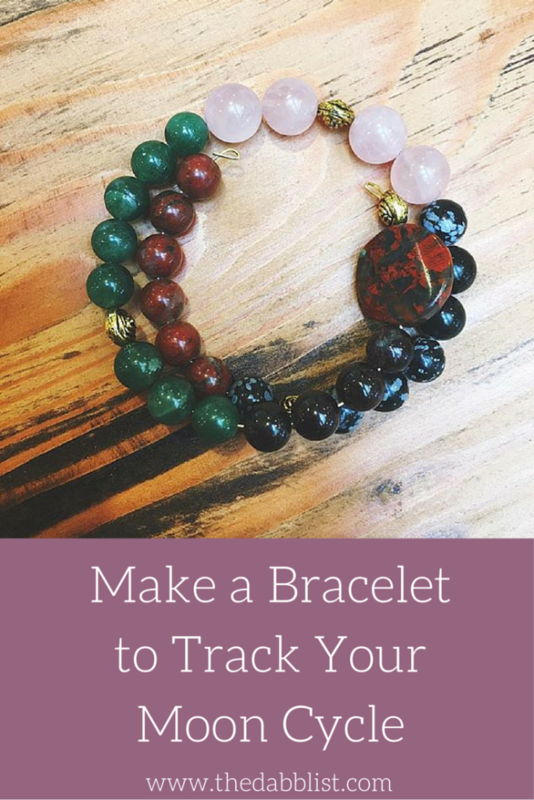 The beads are separated out by color - representing a different phase in your cycle (I talk about the phases of your cycle in this post) and you use a charm to move along the beads to keep track of where you are in your cycle. It’s practical and beautiful, my fave! At my monthly full moon sister gathering, we made these bracelets and it was so much fun. Some of the women were worried because they didn’t know exactly how long their cycles were (or it’s different every month). But what I told them was this - make an educated guess based on the length of your last few periods (to help you out, the first day of your period is Day 1) and go with it. The bracelet won’t be perfect 100% of the time, but it will connect your more deeply to your moon cycle than before. If you need to wait to move the charm a few days until your period comes, that’s totally okay. Shape the wire to your wrist (giving it some slack) and cut. Then take one end of the wire and use pliers to make a little loop so the beads don't slip off. Then start with day one of your cycle, which is the first day of your period or menstrual phase. Those beads are red and it's typically 4-5 days. Place one bead for every day of your menstrual cycle on the wire. Then place a little gold (or whatever color) bead and begin the next phase of your cycle which is follicular with a green bead, which is typically 7-10 days. Then another gold bead and begin your ovulation phase with rose colored beads which is usually 3-4 days. Then another gold bead and then it's your luteal phase which is the longest phase of your cycle with a darker bead. Luteal can be as long as 14 days. At the end of your cycle of beads, cut the wire and make another little loop to close off the bracelet. Finish with a little charm (I’ve used goddess charms, little moon charms, and animal totem charms) that you'll attach to a lobster clasp. 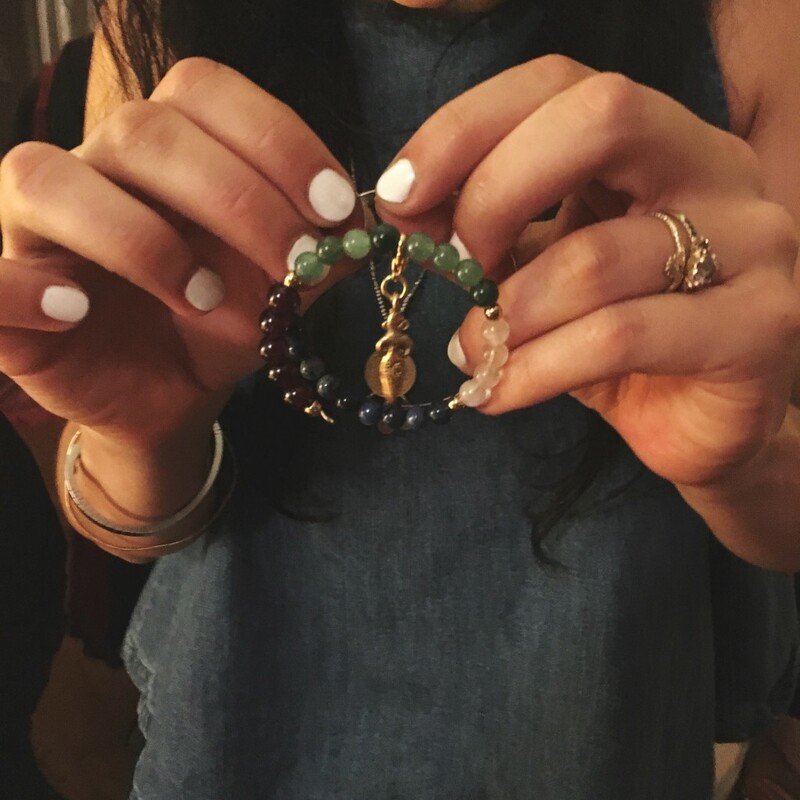 The idea is you move the charm each day to the next bead to help you keep track of where you are in your cycle. My bracelet is for a 28 day cycle and this past month, I went to 32 (I had an extended luteal phase, likely from a little stress). So I just kept my charm in luteal until my first day of my bleed, and then moved it to the red garnet. It's ALL GOOD. What's important is cultivating a deeper connection to your inner moon. I want to know how it goes for you! Leave a comment below and/or share a photo of your bracelet on Instagram and tag me @beccapiastrelli. I am a new member,love your website. Suggestions for Crones for a bracelet? No periods anymore but certainly have cycles. Would love to hear from you. Thank you for mentioning this, Elsabe! You and a few other women have been voicing the same desire around having a bracelet in your wisdom aged years. My suggestion is to make a moon cycle tracking bracelet for la luna in the sky. Break it down into the four phases with 4 different colors or one color in different shades, sort of like am ombre effect. I hope that helps!